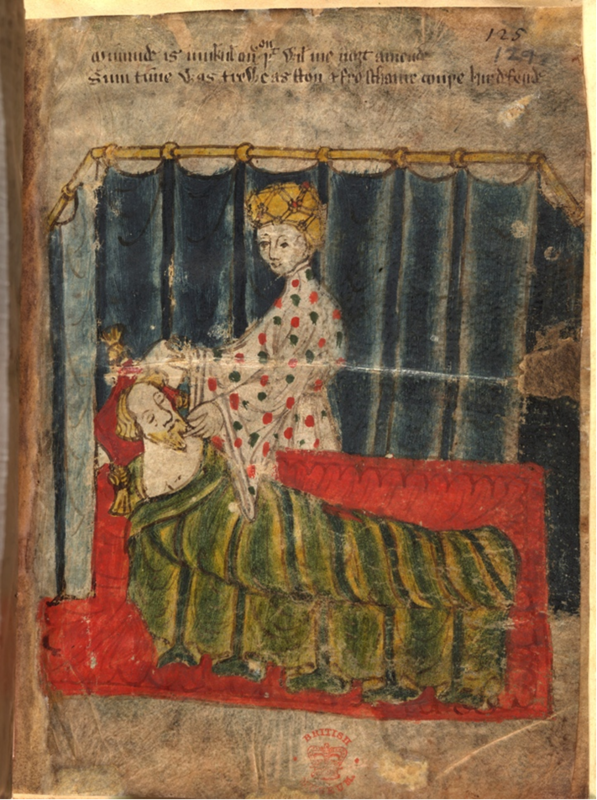 Illustrating the Gawain Manuscript: New Scientific Evidence! New scientific analysis may completely change our understanding of one of the most famous manuscripts for students of Middle English literature. 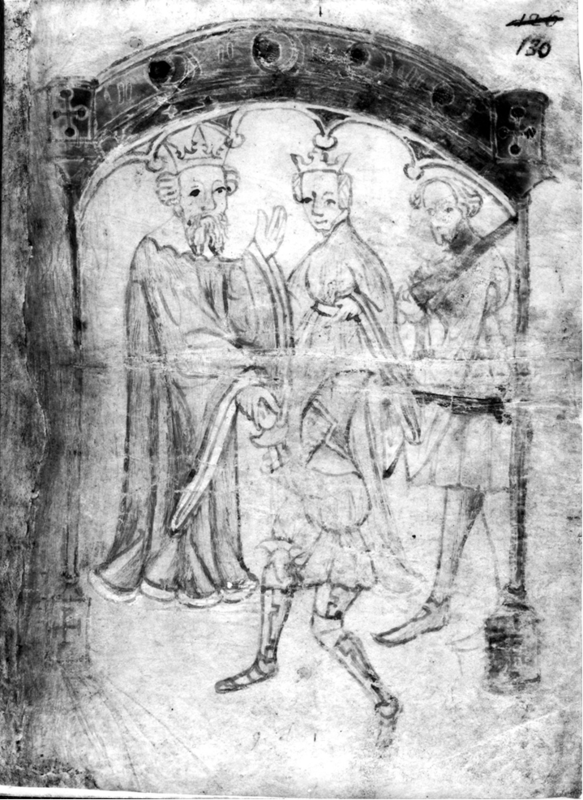 British Library Cotton Nero A.x is the sole extant manuscript of the works of the so-called Gawain-poet, the anonymous author of Pearl, Cleanness, Patience, and Sir Gawain and the Green Knight. These jewels of the Alliterative Revival are today some of the best-known medieval English works, but we would not have them at all if they did not survive in this single late fourteenth-century manuscript. 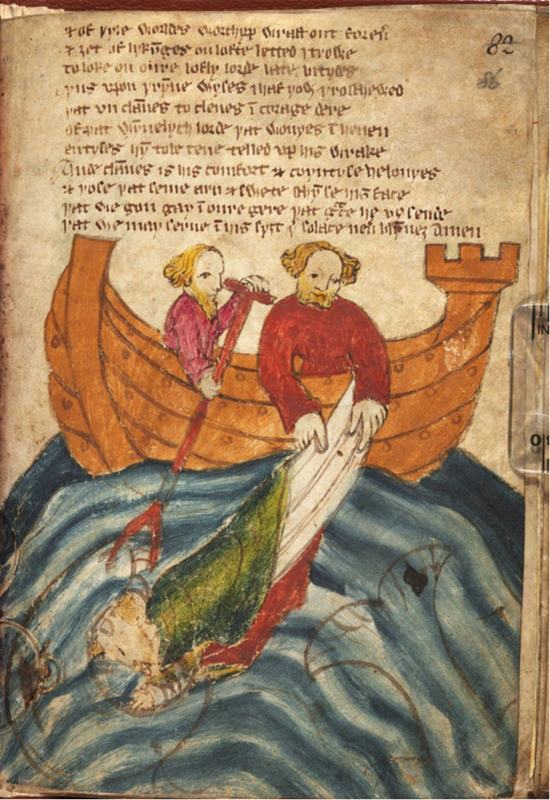 Even better for students of Middle English literature is that this manuscript is illustrated, including scenes from all four texts. For years, scholars have offered only a poor critical assessment of the pictures, an assessment that a few more recent scholars have begun to reexamine. Are these really the crudely executed illustrations of an amateur artist? 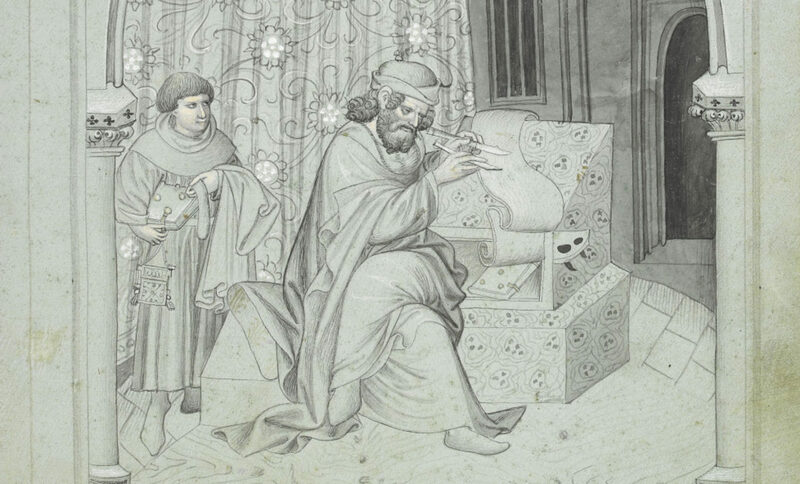 New discoveries, based on analysis of the pigments and ink, may change our understanding of the part these illustrations may have played in the original production of the manuscript. Maidie Hilmo, of the University of Victoria, has studied these illustrations extensively, most recently in a new overview of the pictures that she has written for eventual publication on the Cotton Nero A.x. Project, an international initiative of the University of Calgary to make digital images, transcriptions, and critical editions of the manuscript more widely available. She requested a scientific analysis of the pigments, and one of the most striking results is that the same iron gall ink was used for both the text and the underdrawings of the images, as Paul Garside, the Senior Conservation Scientist at the British Library, has indicated. 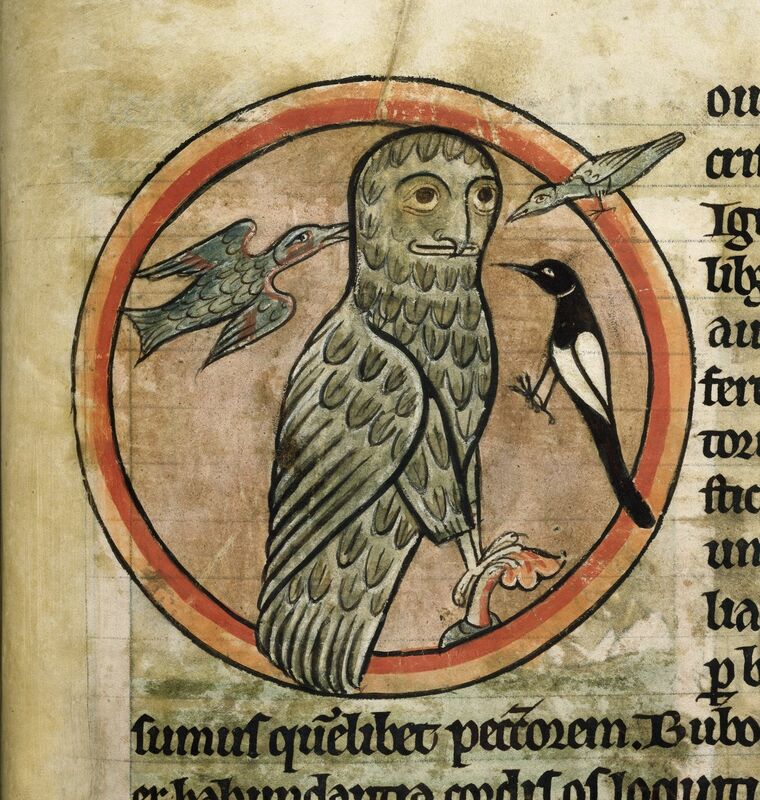 Is it possible this may mean the illustrations, or at least the underdrawings, were drawn around the same time the manuscript was originally written, possibly even by the scribe? There is no smoking gun, but it is true that iron gall ink was not what illuminators ordinarily used for their drawings – this ink was far more typically the medium of scribes, rather than manuscript artists, as indicated by Mark Clarke, an internationally acknowledged expert on medieval pigments. Hilmo invites the meditative reader to reconsider the function of the miniatures not only in illustrating individual poems but also in linking all four poems into a cohesive narrative reshaping and unifying them “into a larger interpretive, typological and iconographic framework.” Whether or not a thoughtful scribe was involved in this visual reconceptualization of the poems as a whole, this study encourages us to see fresh meanings in our successive encounters with Cotton Nero A.x. For the full explanation of this new research, explore Hilmo’s overview and a draft of the complete article now available on the Chequered Board (she encourages responses). 1. See A. I. Doyle, “The Manuscripts,” in Middle English Alliterative Poetry and Its Literary Background: Seven Essays, ed. David Lawton (Cambridge: D. S. Brewer, 1982), 88–100; Sarah Horrall, “Notes on British Library, MS Cotton Nero A X,” Manuscripta 30 (1986): 191–98. 2. Jennifer A. Lee, “The Illuminating Critic: The Illustrator of Cotton Nero A.X,” Studies in Iconography 3 (1977): 17–45. If you and I were to go for a stroll through the streets of London—let’s say, one summer afternoon in 1392—what kinds of sounds would we hear? According to William Langland’s late fourteenth-century poem Piers Plowman, we might hear a cacophony of street cries including the shouts of cooks and tavern-keepers: “Hote pyes, hote! / Goode gees and grys! Ga we dyne, ga we!” (Prol. 228-35). (Incidentally, London’s street cries have been featured in musical compositions from Renaissance madrigals to twentieth-century composer Luciano Berio’s “Cries of London.”) But if we happened to be in London at just the right moment, we might hear something remarkable—the arresting sounds of a procession. A procession–broadly defined as a group of individuals moving along a specific route to a certain destination–would capture our attention in numerous ways. As Kathleen Ashley has written, processions offered a “fusion of sensory experiences, or synaesthesia” (13). Indeed, they were both visually compelling, featuring canopies, torches, reliquaries, crosses, and flowers, and also aurally compelling, with singing voices, ringing bells, and the sounds of lutes, drums, and cymbals. London would have seen many different kinds of processions—all of them with distinctive sounds. There would be royal processions creating an atmosphere of splendor and pomp. 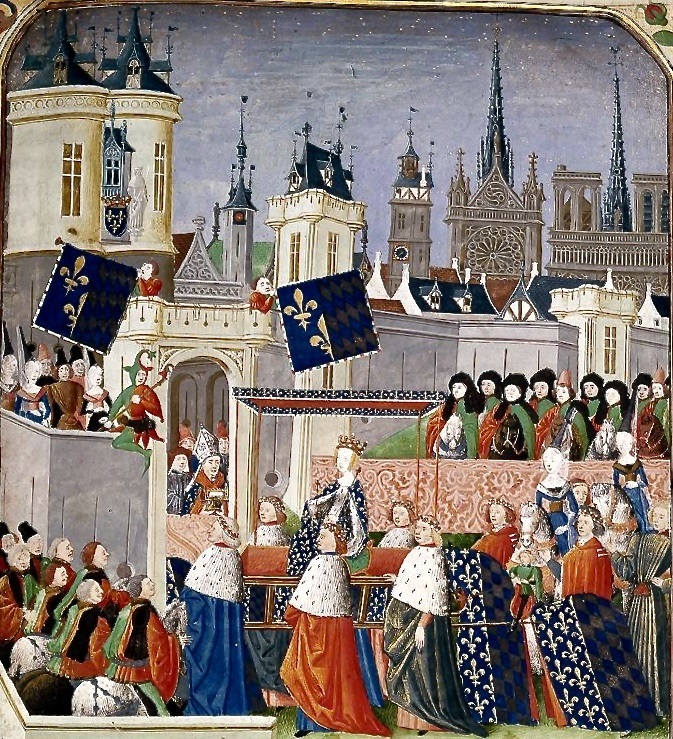 Often (as in the image below) musicians would accompany these regal processions, and sometimes dancers would also perform. Religious processions would also pass through the streets, celebrating various holy days (e.g., Christmas, Easter, and Corpus Christi). These often featured ringing bells and chanting voices, and such sounds were thought to ward off demons and elicit divine grace. 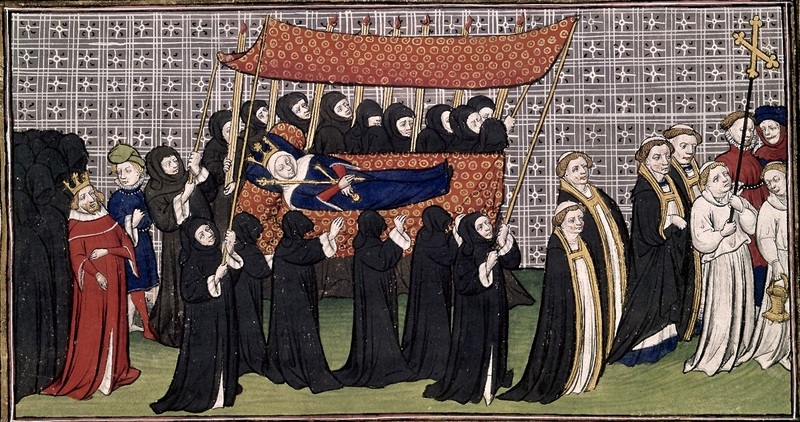 Of course there were funeral processions, where corpses were carried through the streets as mourners wailed and bells tolled–undoubtedly an almost constant sound during the time of the plague. 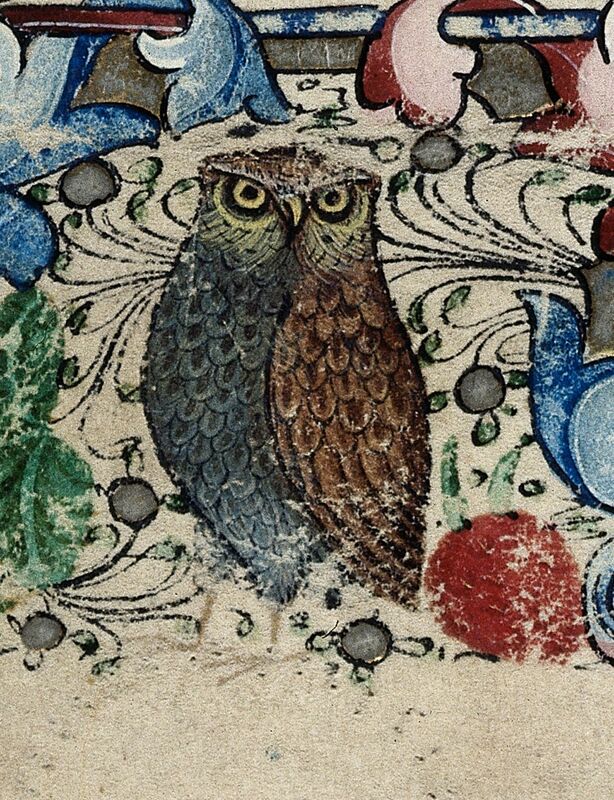 As the popular medieval philosopher Boethius wrote, “The cause for weeping might be made sweeter through song” (8). 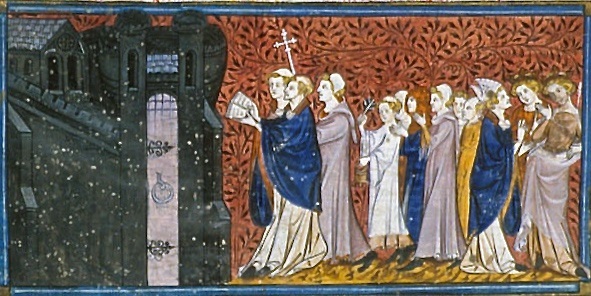 Like Langland, Chaucer infuses his writing with the sounds he experienced in London, and in the Prioress’s Tale, he specifically incorporates the sounds of processions. In the beginning of the story, the clergeon sings the antiphon Alma redemptoris mater as he walks to school and back home: “Ful murily than wolde he synge and crie” (553). It is a kind of solo procession. Later, we find a foreshadowing of the clergeon joining a heavenly procession of virgin martyrs where he will follow “The white Lamb celestial” and “synge a song al newe” (581, 584). Towards the end, the clergeon’s body is carried through the streets to the abbey “with honour of greet processioun” (623). Miraculously, he continues to sing the Alma, serving as the musician at his own funeral. It seems fitting that such a series of processions should take center stage in the Prioress’s Tale since the Prioress herself would have come from a nunnery where processions formed a significant part of life. In fact, we have medieval documents (e.g., the Barking Ordinal) that provide instructions for nunnery processions. As the image below suggests, these processions would have been aurally compelling. 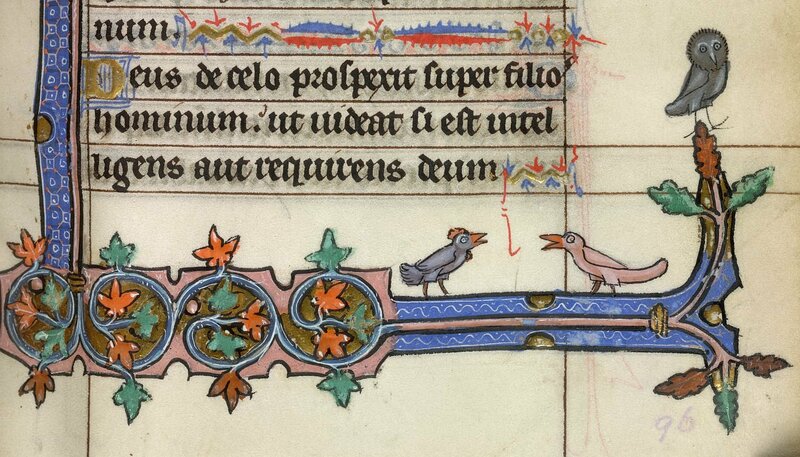 Notice the one nun pulling the bell rope and the others singing from books with musical notation. 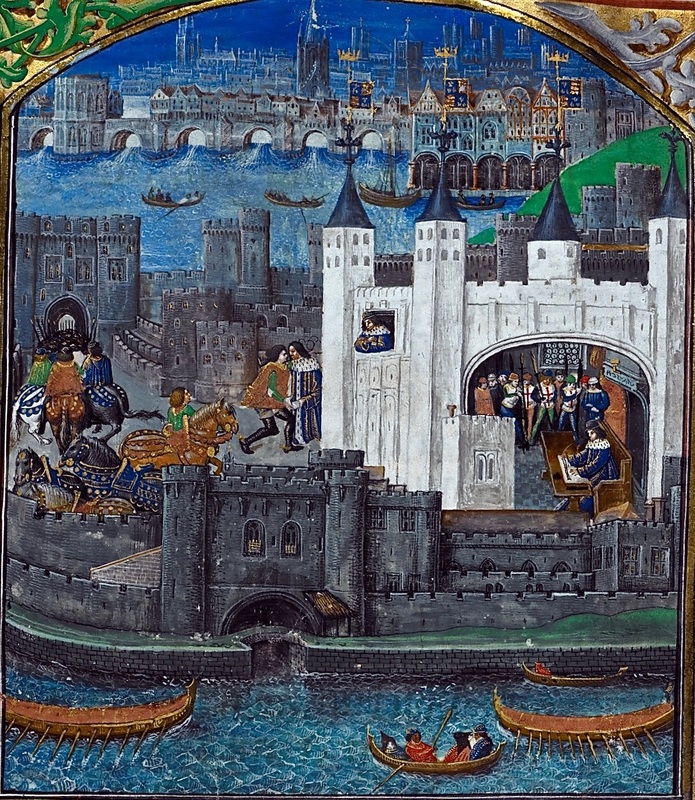 We can add a new dimension to our understanding of life in the Middle Ages by reconstructing some of the sounds of the streets of medieval London. Such sounds have not altogether died away. In closing, here is a performance from the 2015 Mummer’s Parade in Philadelphia — a parade with roots reportedly dating back to the Early Modern period. Ashley, Kathleen and Wim Hüsken. 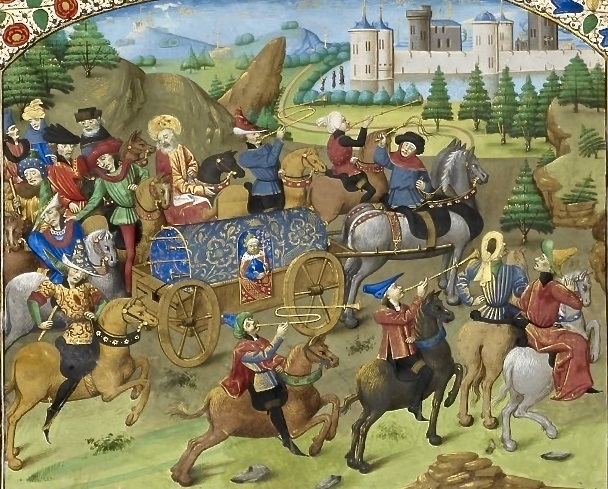 Moving Subjects: Processional Performance in the Middle Ages and the Renaissance. Amsterdam, Atlanta: Rodopi, 2001. Chaucer, Geoffrey. The Wadsworth Chaucer, formerly The Riverside Chaucer. 3rd ed. Ed. Larry D. Benson. Boston: Wadsworth, 1987. Derek Pearsall. Liverpool: Liverpool University Press, 2008. Reynolds, Roger. 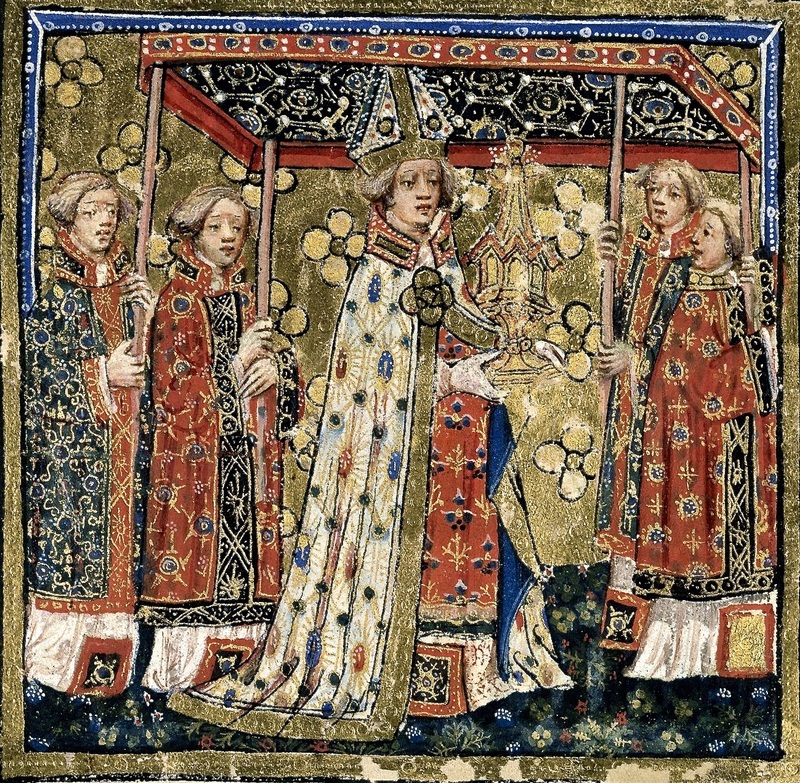 “The Drama of Medieval Liturgical Processions.” Revue de Musicologie 86.1 (200): 127-42. 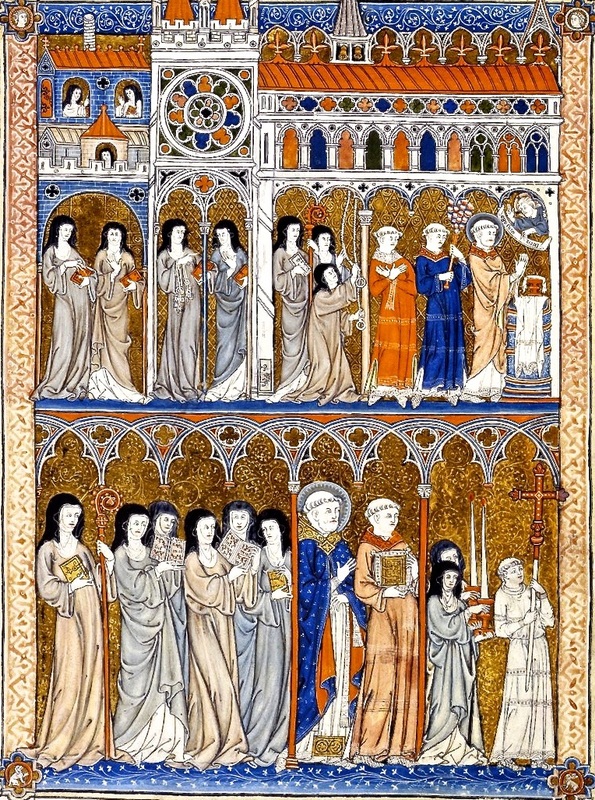 English Nunneries. New York: Palgrave, 2006.